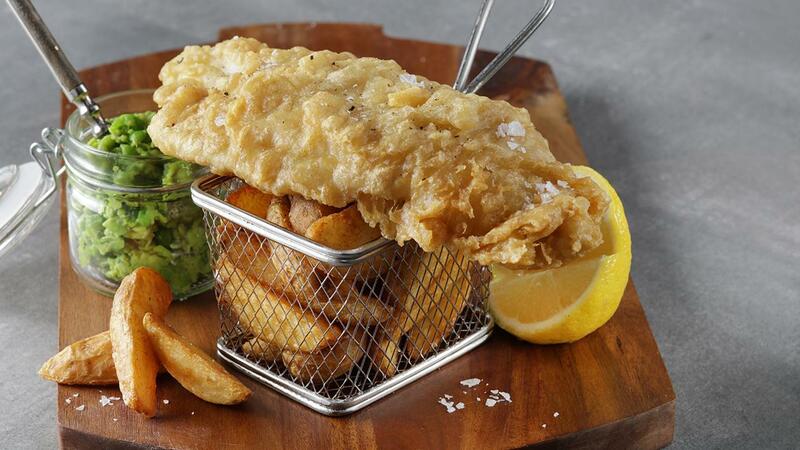 Fish and Chips is a great British classic dish.Triple cooked chips may put you off with all the work involved but it is quite easy and worth the effort. This method doesn't fry the chips twice. Instead, we blanch them once, fry them once & then finish off in the oven. Sauté onions, garlicand ginger until light brown. Add the peas and cook until soft. Season with salt, pepper and Knorr Lime Seasoning before mashing with a hand blender until your desired texture. Add Best Food Real Mayonnaise for that extra richness. Make batter by mixing Knorr Batter Mix, and water. Set aside in the chiller for 15min before frying. Dust the fish with Knorr Batter Mix flour before coating in the batter.